Anna Karenina is in a loveless marriage; her husband is more interested in his career than her. During a trip to Moscow she falls in love with Count Vronsky, though she decides to remain committed to her marriage for the sake of her son. Upon return to St. Petersburg, Vronsky follows, and Anna makes the mistake of introducing him to her husband. Highly abridged version of Tolstoy's 900-page novel is quite enjoyable; Garbo is strong in her role but Fredric March is miscast. Won the Mussolini Cup at the Venice Film Festival. 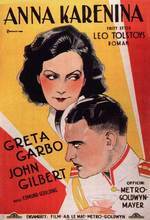 Greta Garbo played this very same role in the earlier adaptation, Love (1927).